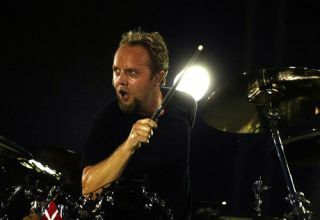 Sonisphere have pulled the ace of all aces from up their sleeves by bringing thrash's big four (Metallica, Slayer, Megadeth and Anthrax) to the UK this summer, and - unsurprisingly - Lars Ulrich has plenty to say about the massive announcement. In a statement the ever excitable drummer had this to say: "As soon as the Big 4 gigs started rolling across Sonisphere Festivals in Eastern Europe last summer, we all felt we were part of something special. The vibe within the bands was more than anyone had anticipated and the vibe with the fans was so next level, it completely blew our minds . . . there was no way this should not happen again!!! So I am beyond psyched that the first Big 4 show in Western Europe will take place on the hallowed grounds of Knebworth, where so many unique and special gigs have happened over the years. There is simply no better venue for a European round two of the Big 4!! Put your dancing shoes on, this is gonna be fun!" We think he's pretty excited. And who wouldn't be? While we're here, any excuse to bust out this simply fantastic clip of Lars getting a face full of beach ball (there's a phrase you don't hear every day) during a recent Metallica show. For even more thrash, get yourself to www.myfavouritemagzines.com and pick up our special thrash issue, which is available for a few more days.